Recently, I have found myself day-dreaming about foods and dishes from home that I have not been able to find in Thailand. For starters, my Chicago refrigerator was never in short supply of cheese (especially goat cheese), avocados and at least one bottle of Kim Crawford sauvignon blanc. To say that these three staples from my Chicago life are sparse in Thailand would be an understatement. White wine is bought at the local 7-11 (you have a choice between two equally mediocre bottles) and we have to drive on our motorbike 10km just to buy a block of cheddar cheese, spending an arm and a leg for both. Recently, I have had a craving for a recipe I found in Cooking Light Magazine last summer: Crunchy Shrimp with Toasted Couscous and Ginger-Orange Sauce. I made this dish for my parents one night last June and lets just say there were no leftovers. I even made the dish again the next night. The textures and bold flavors of this dish are really what make it a homerun. 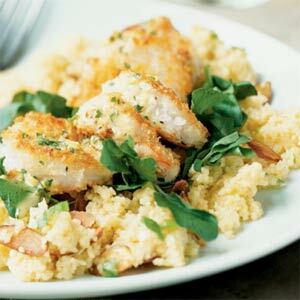 The panko (Japanese breadcrumbs) encrusted shrimp or chicken and the toasted almonds add a crunch to the “melt in your mouth” citrus-infused couscous. The layer of watercress gives the dish a fresh yet peppery taste that is countered by the sweet orange ginger sauce. This dish has it all, and to top it off, it’s healthy. If you are like me and can find an excuse to add goat cheese to just about anything, a few crumbs sprinkled on top adds a creamy component that is absolutely delicious with the citrus dressing and tempura shrimp. Tip: When breading meat or seafood, I prefer to use panko breadcrumbs, trust me, the end result will taste better. If you are having trouble with the tempura breading crumbling off into the pan, coat the meat or seafood in flour, salt and pepper before the egg wash, it helps everything stick together. I can’t wait to have you home in my kitchen….I need a cooking buddy! Yum!